Where Do You Keep Your Owl/Not-Owl ? I tried the fireplace first, but you can see it’s already pretty crowded. I bought a long new redwood 4” x 12” beam just to have it around. By and by, I started carving it for sculpture projects. Some worked out, some didn’t. When you have a beam and the project goes sour, well, you still have a beam. So, I used one of those second chance boards to make this “owl / not owl” piece. When the legs are pulled together, the owl looks like it is sitting atop a large bush. These parts and materials are left over from my previous projects. 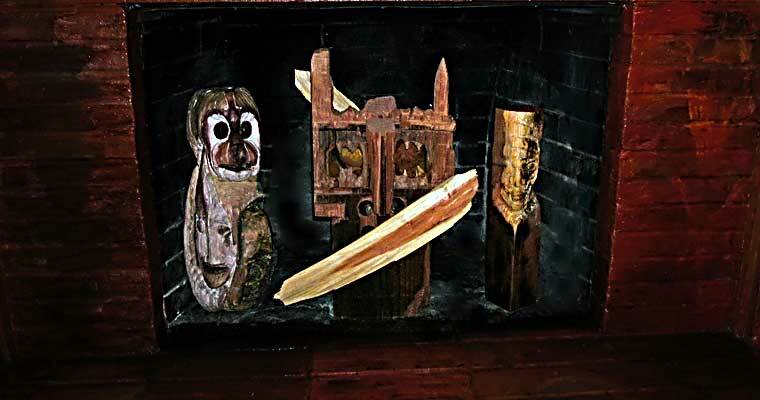 Author Peter NeibertPosted on May 26, 2013 August 4, 2016 Categories photographic print, sculpture in Marin County, Uncategorized, wood sculptureLeave a comment on Where Do You Keep Your Owl/Not-Owl ? 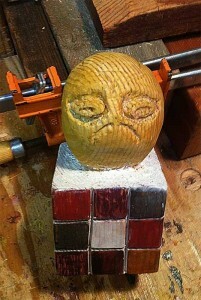 You can see here that the Face Blind influence finds its way into most of my sculptures. Don’t overlook the brick fireplace in the picture. I removed the fire insert (700 pounds) and refinished the bricks in hard acrylics. Yes, I did. I do better carving images of people than talking to them. “Face Blind” means I don’t recognize people I’ve met. I usually ignore them because I don’t know who they are. They, of course, know who they are, know me, and they really don’t like to be ignored. Face Blind: 0.5, 1, 2, 4, 16 — wood sculpture by Peter Neibert 2013. click on photo to enlarge. That’s what I show in my “Face Blind” sculpture — my multiple face blind images 0.5, 1, 2, 4 & 16 at left and below. My face blind carving shows faces with foreheads, eyes, glabella (upper bridge of the nose), upper cheeks but no nose, mouth or chin. Brainy people tell us the nose, mouth and chin are key to the brain, that the brain uses these features in combination to recognize other people (and, yes, oneself). Except sometimes it doesn’t work. 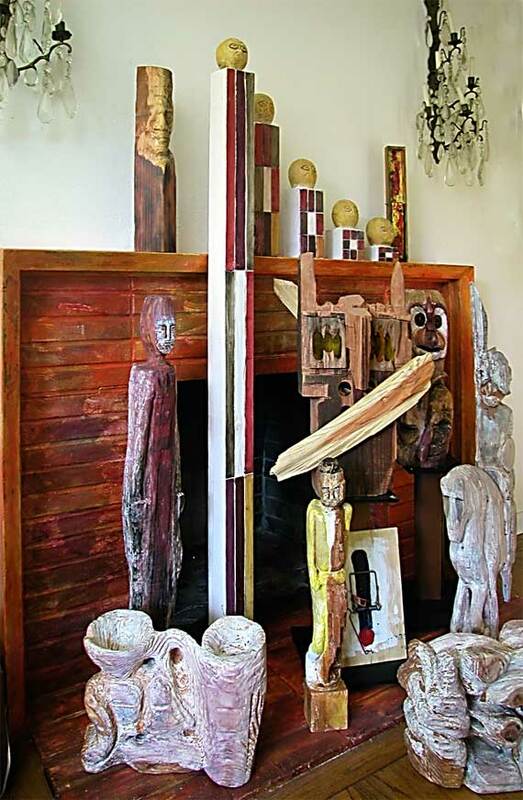 Figures carved in my multiple sculpture show no noses, mouths or chins — by now, the meaning is intuitively obvious to the casual observer (you). But the progression in sizes, 0.5, 1, 2, 4, 16 … what’s happening there? Let your brain work on that. Face blind image 1 with forehead, eyes, nose bridge and upper cheeks. 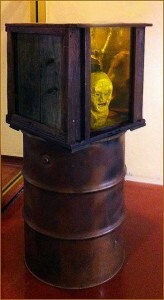 “Head Case” on used barrel pedestal ~ 3 wood carvings in gold light inspired by Nara period gigaku masks. Sculptor Peter Neibert. Click on photo to enlarge. 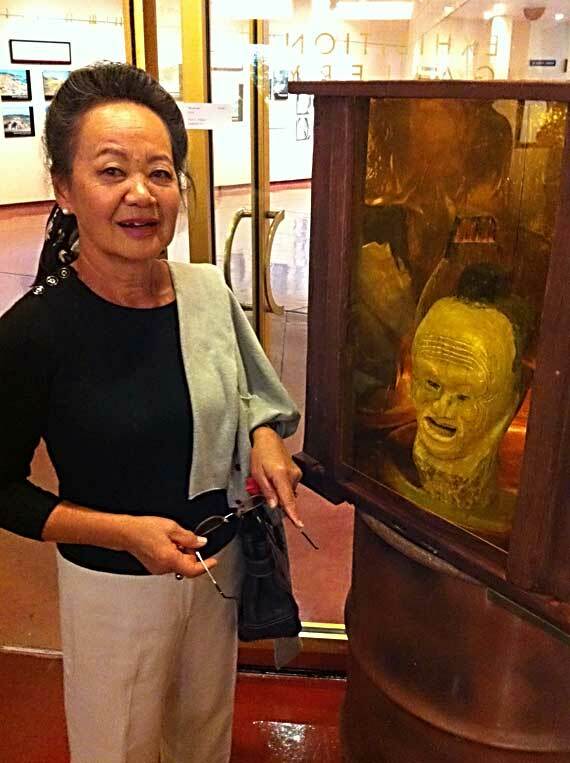 “Head Case” is this Media Container for three wooden carvings, inspired by 7th Century Japanese theatrical masks. It’s mostly made of reclaimed redwood, and it’s on view, free, at the first floor gallery of the Marin Civic Center (just walk-in the South entrance, and you will come to it right away). For a preview and description, go now to Wood Sculpture in Gold Light. 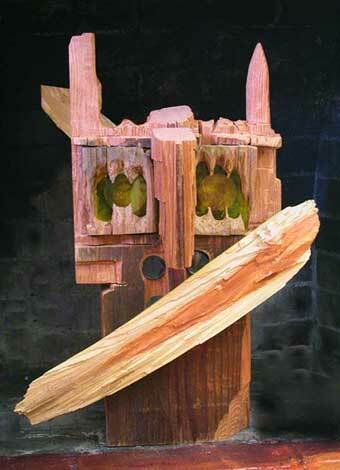 This COM (College of Marin) Student Art Exhibition includes wood, stone, steel, bronze and papier mache sculptures.